Beginning May 1st, writer Dave Roman and artist John Green will be serializing their next graphic novel, Teen Boat! The Race for Boatlantis as a webcomic that will be available at TeenBoatComics.com. The Race for Boatlantis is a sequel to the creators' 2012 graphic novel, Teen Boat, about a teen who can turn into a boat (yes, really) and his many teen/boat adventures. Readers can give the new story a try via the webcomic, and Roman and Green will interact with their audience as they experience it, with new pages going up every Monday, Wednesday, and Friday until the print book debuts in the fall. ComicsAlliance spoke with Roman and Green about the decision to offer their graphic novel as a webcomic and what readers can expect from this new story of everyone's favorite boaty teen! ComicsAlliance: Did you know when you started working on Teen Boat! The Race for Boatlantis that you wanted to offer it as a webcomic? Dave Roman: When John and I set out to make the second Teen Boat book we intentionally wanted it to have a bigger, more cinematic narrative. We jokingly compared it to Joss Whedon’s Firefly TV show versus Serenity, the movie that followed. But we still broke Race for Boatlantis up into satisfying chapters, with a high gags-per-page ratio that add up to a cohesive whole. So we knew it would translate well to the web, ebooks, or even vinyl records! And so far, all of the long-form comics I’ve worked on (including Jax Epoch and the Quicken Forbidden, Agnes Quill, Alien Circus and my latest, Starbunny, Inc.) have been serialized as either webcomics, single issues, or mini-comics before being published as graphic novels. John Green: While the first book was mostly released as mini-comics, we did put a few issues of it online, and quite a few people thought it had been a webcomic to begin with. Releasing the Teen Boat sequel as a webcomic wasn't at the forefront of our minds when we were developing the story and art, but we did toss around the idea when brainstorming marketing possibilities with our publisher. CA: Who came up with the idea to serialize it as a webcomic prior to its print release? DR: First Second Books did webcomic versions of Sailor Twain by Mark Siegel and Nothing Can Possibly Go Wrong by Prudence Shen and Faith Erin Hicks to great success, so I asked if I could do the same with Astronaut Academy: Re-Entry since the original book, “Zero Gravity,” was a collection of material that had started online. The publisher was into it, and I ended up having a blast interacting with fans and watching them get increasingly excited for the book’s release. So I really pushed Teen Boat's publisher to do the same with the new book, because I feel like there’s a bigger potential audience that still hasn’t discovered it yet. It’s harder and harder for people to get to bookstores these days, and people seem to make a lot of their choices before they even get there. So raising awareness of Teen Boat before the book comes out is crucial to its success. JG: The publisher for Teen Boat, Clarion Books, is newer to the comic book/graphic novel scene, so serializing the book online is a bit of an experiment for them, but they recognize the potential for bringing in new readers with a few pages every week before the full package is available in print. CA: Has anything changed in how you work together and how you work individually since the first Teen Boat? DR: We don’t take as many bus trips together as we used to! Traveling and tabling at comic book conventions was once a big part of our lives, and put us in the headspace to create something as wonderfully weird as Teen Boat in the first place! Creatively, John and I shared so much in common that we could basically exchange pop culture references in secret code to make a comic. Over 80% of the first Teen Boat was finished by the time Clarion agreed to publish it. But with the second book John and I had to produce a much more detailed script so that our editor could follow along. Just saying “trust us, it will be even cooler than the first one,” wasn’t convincing enough! JG: The biggest difference was having the whole book written in script form before drawing. The first Teen Boat book was made almost entirely in eight-page increments. Dave would write an issue of the mini-comic, and I'd draw it, and for the most part we had no clue what the following issue would be about. We'd print it up, sell it at conventions, then four months later (or whenever the next convention we were exhibiting at was) we'd write and draw the next mini-comic. For the second book, Dave and I maybe had two or three all-day jam sessions where we figured out the story beats, the chapter breaks, and so on, and then I would do character and location sketches while Dave wrote the full script over a few months. Then I thumbnailed and lettered the entire book before starting penciling. The book was practically copyedited before any final art was drawn. And then I became a hermit for a year and a half as I penciled, inked, and (with help) colored it. It was very different than drawing eight pages over a week or so and then printing up photocopies at our day jobs and getting instant feedback from the fans that bought it at that weekend's convention. CA: You mention that the first Teen Boat started as a series of mini-comics. What changes in your approach to spreading the word about a project when you work with a major publisher? JG: Since The Race for Boatlantis wasn't going to be released as eight-page mini-comics every few months, we knew Teen Boat wouldn't have as much of a presence at the conventions we'd be at while we were working on it. And not having a new mini-comic for each convention meant doing fewer conventions, because I couldn't justify going to a show when I could be working on the book. That's the hardest part, I'd say, because you want to go to these shows, and remind your fans that you're working on the next book, and let them know when it comes out, and having a mini-comic of the next chapter was always a great way to accomplish that. That said, working with a major publisher is incredibly beneficial. Clarion has school and library outlets and other resources that Dave and I just didn't have access to by just doing the mini-comics. It is different, because they think about markets and demographics and age groups and reading levels — all things not going through my head when sitting behind a small press table at San Diego Comic-con trying to sell a black & white mini-comic to anyone with a dollar to spare. DR: Working with a publisher like Houghton Mifflin Harcourt/Clarion is great because now we have a team of awesome marketing people who can help us get the word out. It used to be just the two of us hand-selling everything. If you heard about our comics, it was only because we told you! 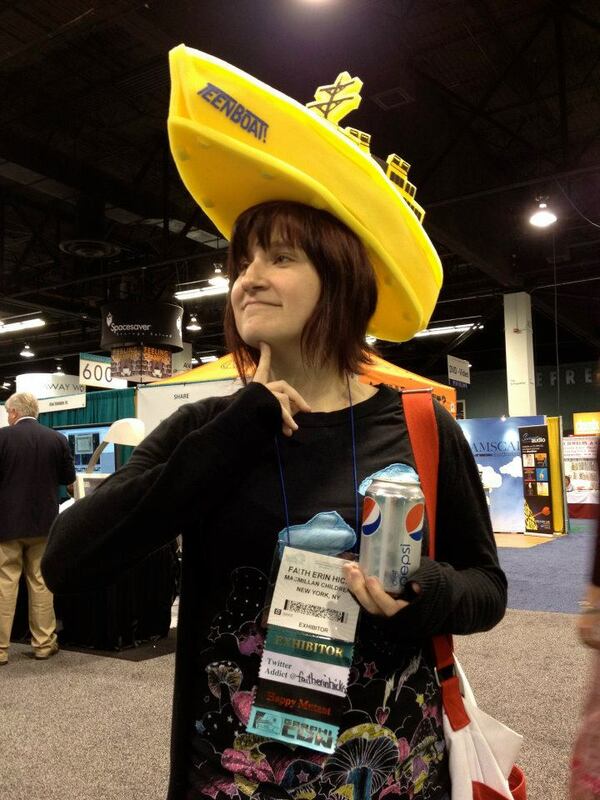 With the release of the first Teen Boat graphic novel, the folks at Clarion made these hilarious foam boat hats to give away at library and teacher conferences. One interesting thing that has come up, though, is some people assume that it’s still better to buy the books directly through us, the way they did in our mini-comic days. But it’s actually more helpful to buy graphic novels through a bookstore or comic shop, because it supports both creators and retailers, creating a viable booklover’s ecosystem. CA: What are the advantages of serializing before you release the print copy? JG: Hopefully getting people to talk about the comic, and take their time digesting the story, and getting invested in the characters, because they'll have to read it no faster than a page every other day. Graphic novels can be read in their entirety in a fraction of the time it takes to read a prose book of the same length. Sometimes I think people burn through comics too quickly, and can miss a lot of nuance and subtlety in the art. Plenty of people read the books again, over and over, especially kids, and it's great when they go back and appreciate the art, but by serializing maybe they'll have a bit more anticipation for where the story is going, or maybe they'll spend more time examining the visuals. DR: Serialization is the future! It’s also the past. Charles Dickens did it with his books, and Teen Boat is the graphic novel equivalent of Great Expectations, with the added value of armed narwhals and robot pirate ships. Webcomics create an opportunity for people to discover your work in a space they already feel comfortable (social media), making it easy to share and link to among friends. It’s really the ultimate word of mouth. CA: What can fans of the first Teen Boat expect from the sequel? JG: It's a stereotypical thing to say, but everything in the sequel is bigger and better. The boats are bigger, the explosions are better, the stakes are higher, the emotions are deeper, the water itself is deeper, and just about every question raised within book one is answered in The Race for Boatlantis. It also has an epic naval battle and a school dance! DR: More explosions! And a surprising amount of sincerity, too! The idea of Teen Boat facing off against a rival named Teen Bot is super silly, but ends up being the catalyst for our hero to transform from selfish adolescent into a well-rounded human being (who just happens to turn into a boat). We tried to put a comical light on the intense highs and lows that we all go through during our final year of high school. CA: What about folks who have never read Teen Boat before? Will they be able to jump right into this book? JG: I think so! Dave and I spent a good deal of time making sure the sequel is accessible to new readers and can stand on its own sea legs. There are definitely threads, gags, and character arcs that have more of a payoff if you've read the first book, but there's plenty of reintroduction/reminders of previously established characters, relationships, and plot points. DR: If you have a high enough diving board, you can definitely dive right into it. CA: Anything else you want to say about the project? DR: I think it’s the best book I have ever been associated with. Certainly the one I’m most proud of. And a large part of that is because of the outstanding job John did with the art. From the epic boat race scenes to the underwater cities, submarines, sea creatures and more, John just knocked it out of the park. And I’m not saying that just because I know that John is reading this, but because I seriously believe it with all my heart. JG: Blush. I just hope people like what they sea. I mean see.